Learn how to perfectly draw figures perfectly with this all-inclusive set! This set includes a little-leaf boxwood stand plus a great manikin which is fully position-able measuring 5-1/2”. The set also comes with six drawing pencils made of graphite in grades 6B, 4B and 2B which would be the best for producing detail work, shading and basic composition. A kneaded eraser is also present to make sure you can easily correct or soften the graphite lines. You can always keep the pencils at their best shape through a metallic pencil sharpener that comes with the set. The best part of the set is that it comes with a thorough 16 page instructional booklet that explains how to use the different pencil grades along with illustrations on the essentials of drawing meant to serve both professionals and amateurs alike. 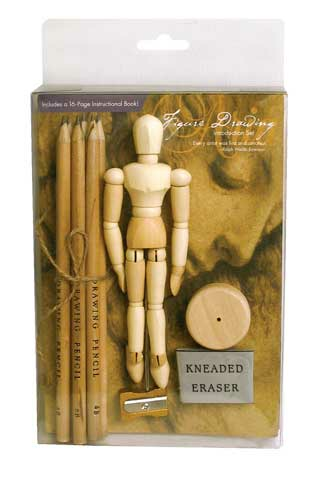 This is the perfect all-inclusive kit to learn how to draw figures especially for beginners.